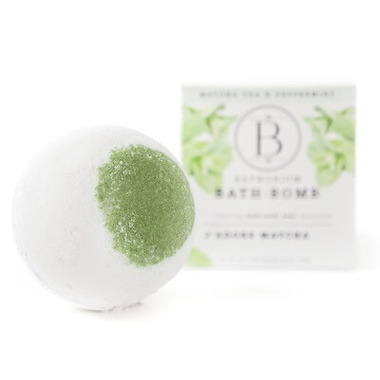 Bathers, meet one of their signature bombs, J'adore Matcha. If you thought Matcha Green Tea was solely meant to drink on the way to yoga class than you better get ready for this! Matcha green tea has ancient sought out properties that naturally detoxify the skin’s outer layer and helps retain moisture throughout the day. Enzymes in green tea have been proven to reduce the look of sun damage and tighten the skin where need be. They use premium grade blended matcha with a silky combination of butters and peppermint oils to leave your whole body and mind relaxed and peacefully rejuvenated. Bath & Tea... It's a matcha made in heaven. Ingredients: Sodium Bicarbonate, Citric Acid, Sea Salt, Matcha Green Tea, Sweet Almond Oil, Kaolin Clay, Avocado Butter, Lemon Oil, Peppermint Oil, Sodium Laurel Sulfoacotate, Aloe Leaf Juice, Organic Dragonwell Green Tea Leaves, Hamamelis Virginiana Water. 3. Drop in the bomb.